CLIFFORD  SMITH GALLERY is pleased to announce its April exhibition in the main gallery of new work by Jeff Konigsberg. 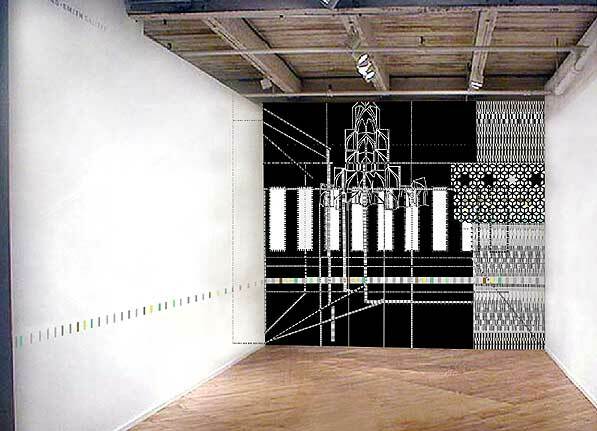 Konigsberg, a 1998 graduate of the MAEd program at Massachusetts College of Art, presents a major wall drawing covering over 36 linear feet of the gallery walls. He has also developed an accompanying suite of new prints which will be presented with several smaller works on drywall. This exhibition is mounted in conjunction with Revolution and Representation, the 2003 Southern Graphics Print Conference being held at Massachusetts College of Art from April 2 - 5, 2003. The Gallery will also participate in a special Sunday afternoon walking tour of the South End galleries on April 6, 2003 from 10am - 2pm. This Sunday event is free and open to the general public as well as conference registrants. left wall: 12ft. x 21ft. far wall: 12ft x 13.5ft. Konigsberg's newest work combines geometry and tessellation, with architectural depth, evoking our schematized and constructed world. An investigation of interior and exterior space, it is a look through walls, floors, and ceilings, revealing actual and invented structural supports, engineering details, external views, and extensions of the existing confines, in a pointless perspective. Using a base of sheetrock, and in the vein of Renaissance frescos or decorative Islamic mosaics, the work is comprised of the wall itself. The works are on the wall for a reason; they interact with the spaces they inhabit. For color he cuts and peels away sections of sheetrock to reveal the underlying brown paper or white plaster. In addition, he employs many different colors of sheetrock which he cuts and adheres to these sections. The large works are formed either directly on and into the preexisting wall, or on separate colored sheetrock panels, which are then installed on the surface. His small works are created on panels of Sheetrock, and installed into, and flush with, the wall. His new suite of screenprints reflects similar concerns, although in a somewhat pared-down format.